It's not really new news any more, The Ileach already mentioned it in their Twitter feed a few days ago and it probably popped up on a few whisky forums. Now there is a bit more information available about an interesting move between two distilleries on Islay: John MacLellan currently of Bunnahabhain is moving to Kilchoman distillery on the 3rd of May. On the Kilchoman Distillery website you'll find the announcement under General Manager, informing us that he will join as just that and ‘will be responsible for the day to day running of the business’. 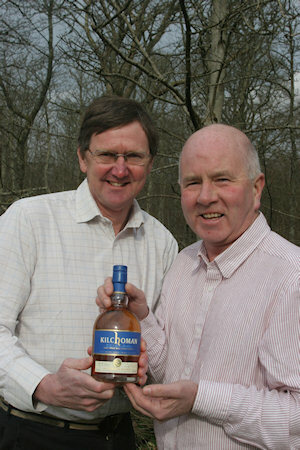 With his many many years of experience in the whisky industry I believe Kilchoman have landed a coup here. From my personal experience of John I also believe he will be a great ambassador for the distillery in general: His wife Lindy often leads walks during the WalkIslay - Islay Walking Week, usually in the area around Bunnahabhain. When returning from a walk and arriving at Bunnahabhain we were welcomed by John (and when they were home their children) with a wee dram of the local whisky. Once or twice he also started the distillery bus to drive us back to our cars. As such not a big thing, but a nice friendly gesture which at least for me created a lot of good will for Bunnahabhain. I hope he will be able to continue in a similar fashion in his new position at Kilchoman. For a few other voices try Angling and Dramming, the Whisky Whisky Whisky Forum and the Belgian Cask Six forum.